This Limited Edition Alvar Aalto Tea Trolley 900 in Orbit by Artek + Heath is no longer available. Experimental glazes from the 1940s meet innovative wood-bending techniques from the 1930s for a distinctive, memorable collection. 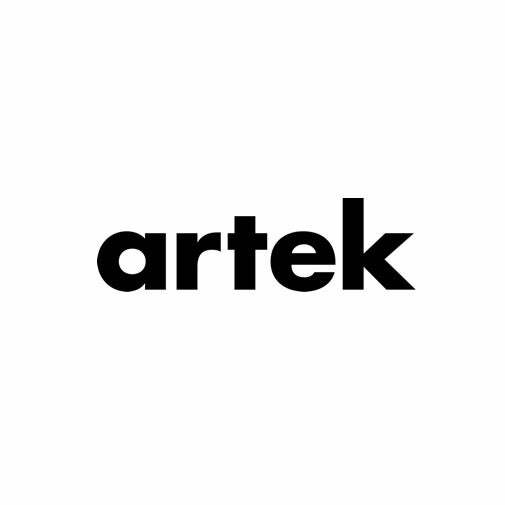 As an edition of six designs with only six of each made, the iconic Artek Tea Trolley is inlaid with tile inspired by Heath Clay Studio glaze experiments and installations found in the historic Sausalito factory. The Maze and Orbit tile tops are created by placing tiles on a spinning wheel. Glaze is applied with a squeeze bottle, creating concentric lines. This results in two styles: one more graphic and precise, and the other intentionally blurred. Dimensions: 35.5” L x 25.6” W x 23.6” H. Materials: Form-bent solid birch lamella, MDF, rattan, ceramic tiles. This trolley is #2 of an edition of 6. Please inquire about custom tile commissions inspired by the tile on the Tea Trolley 900 collaboration. 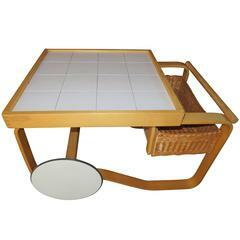 This is a rare tea trolley model 900 designed by Alvar Aalto for Artek, Finland, 1940s. From the estate of the great composer Gary Geld and in good condition.